Enjoy the Luxury of CLC Lighting! 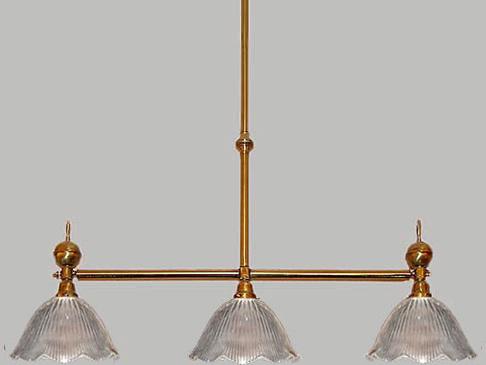 A 1940's deco electric fixture featuring octagonal 'Chevron' glass and Beehive Ceiling Canopy. A large 4" ball and acorn known dress it up below the center body. Traditional and quite elegant! More or fewer arms, custom height and/or width is no problem! Can be designed with glass facing up or down. Free mounting hardware included. Shown in Satin Brass. Available in different Metal Finishes, different Glass, Back Plate, multiple arms and many other Custom Options.